Hollywood Pictures, widescreen 2.35:1, languages: English (DD 5.1), French (DD 2.0), subtitles: English, single-layer, scene selections-16 chapters, rated R, 107 min., $29.99, street date 10/13/98. Directed by Stephen Sommers. Starring Treat Williams, Famke Janssen, Anthony Heald, Kevin J. O'Connor. From the bottomless depths of the South China Sea, gruesome creatures surface to attack and cannibalize the passengers on a luxury cruise liner. With swift and deadly precision, these voracious serpents swarm through every deck and passageway, devouring all living things in sight, and transforming the vessel into a floating chamber of horrors. For the few terrified survivors remaining on board who are able to elude the bone-crushing forces, a living nightmare awaits them at every turn. Trapped in the middle of nowhere and stalked by the relentless invaders that have entwined themselves throughout the entire ship, time is running out for the last of the human prey, including Finnegan (TREAT WILLIAMS), jewel thief Trillian (FAMKE JANSSEN), the Captain (DERRICK O'CONNOR), the ship's owner, Canton (ANTHONY HEALD), and Pantucci (KEVIN J. O'CONNOR). 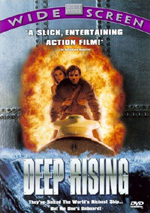 As the doomed ship slowly sinks into the murky waters, Finnegan and his crew hurry to pursue their one chance to escape the bloodthirsty rampage, in Hollywood Pictures' action thriller, "Deep Rising." The audio and video portions are a standout, but not much else went into the DVD production of this Hollywood Pictures release under the Disney umbrella. The single layer-disc contains the 2.35:1 widescreen version, but without anamorphic enhancement. From the static menu are some basic options, no supplements are included except for a trailer found under the inappropriately named "Extra Feature" category. Talk about your extra disappointment. Still, that's all fine and dandy if the disc isn't over priced at $29.99. Unless it is a blockbuster title, I don't find the incentive to pay for that much. I hope that Disney would follow the example of Warner in releasing moderate hit titles at under $20. That goes out to Paramount and Fox releases as well. I have little complaint when it comes to the transfer of the DVD. The presentation is smooth and exhibits none of the jaggedness or shimmering. Images are a tad soft on some scenes, but detailed with occassional grains. The film is set in a mostly dark environment; the cruise ship is stranded in a violent storm and most actions take place below the deck in half-lit corridors. Black and shadow detail are crucial in such an environment and thankfully the picture exhibits clearly defined outlines and depths, instead of a muddy mess. In fact, some of the creature effects have too strong of an outline which bring attention between the real setting and digital effects. But that is not something that the transfer could improve on. Colors are well saturated and the luxurious interior of the ship provides for an absorbing display. The special effects by Dream Quest and makeup effects by Academy Award winner Rob Bottin (The Thing, Total Recall) are generally quite impressive and nothing cheesy like Anaconda. The amount of gores approach that of Starship Troopers. In one shocking scene, the cargo hold is filled with human remains of recent victims, minus the skins. I was having a pizza went that scene came on, let just say it was very hard to swallow afterward. But five minutes later, I was chomping away. In another gruesome scene, a partially digested crew reaches for help to the remaining survivors as the creature's acid slowly dissolves his body. The effect was done by Blur Studio using computer generated imagery tracked into a live-action shot. For the climatic finale, the cruise ship Argonautica was blown to pieces. The pyrotechnics made realistic by actually blowing up a 110-foot model of the ship. The encoded Dolby Digital soundtrack is the main event of this DVD. The violent storm unleashes thunders that are incredibly deep in reveberation. The seemingly unstoppable creatures would just break through metal corridors and compartments in pursue of victims. The sound effects of destructions are powerful and dynamic, actively involving all speakers. The metal hull and pipes lend to the eerie echoes of creaks and grinds that are projected throught a large soundstage with precise localization. Bass extension is a knock-out during the appearing of the big creature and on the final denotation of the ship. Jerry Goldsmith provides an adequate score and scary sound cues to get the pulse racing around every corner. Deep Rising is a load of mindless fun. A perfect film to watch when your buddies are coming over and they demand some entertainment from your home theater setup. The last thing you want to show them is something like Hope Floats. Even Sandra Bullock wouldn't be able to prevent a mutiny in your living room then. So relax, rent Deep Rising, have a few beers, and everyone will have a good time. That is until you've to clean up the mess afterward.